With lots of laughter and obvious camaraderie, the U.S. dressage team appeared to be a cohesive and united team as they answered questions from college students and the local dressage community on a Sunday evening on the University of Kentucky Campus. The team had spent the previous two weeks preparing for the upcoming World Equestrian Games (WEG) with an intensive training camp at United States Equestrian Team headquarters in Gladstone, N.J. While their horses are primed to peak for the games, the focus was on tuning up the riders. Sports psychology, media training and a full dress rehearsal for the games in front of “O” level judges were all part of the program. Steffen Peters and Ravel—This pair has been competing together for three years. They won the 2009 FEI World Cup Final and were fourth at the 2008 Olympic Games. 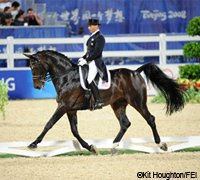 As a bronze medalist (Atlanta ’96), Peters is a familiar face to dressage fans, but at the 2008 Olympics, Ravel was the new kid on the block Today, Peters’ mount has earned respect as a contender and was the 2009 USEF Horse of the Year. 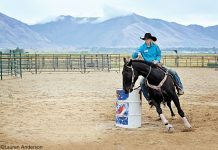 Tina Konyot and Calecto V– Konyot describes herself as a fifth generation horsewoman from a Hungarian and Czechloslovakian background rich in equestrian tradition. She refers to her early training as a mixture of “circus and classical dressage.” Konyot affectionately referred to the impressive looking Calecto, a Danish Warmblood stallion who she bought as an 8-year old at an auction in Denmark, as her “Smoochy Boy.”, revealing a softer side to this imposing duo. According to Konyot, Calecto started out as a bit of an underdog. No one bid on the horse, so she was able to buy him with a friend. “No one believed he would actually be a Grand Prix horse,”she says, “yet 16 months ago, he did his first Grand Prix.” The pair won four Grand Prix classes at the selection trials in August to secure their spot on the team. Katherine Bateson–Chandler and Nartan. Bateson-Chandler was a groom for famed U.S. dressage rider Robert Dover and worked her way up to riding from there. As one who has come up the ground floor, Bateson-Chandler fervently expressed her belief in the power of hard work in a sport that can be expensive to pursue. “You can do this [sport] in other ways, even if you don’t come from money,” she said. She has been partnered with her mount, Nartan,a 15-year old Dutch Warmblood, since May and qualified for the team with a strong performance at the selection trials in Gladstone, N.J.
Todd Flettrich and Otto – Flettrich’s mount Otto is also a Danish Warmblood, like Calecto V. It is also worth noting that Otto is the only American-born horse on the team. Like Bateson-Chandler, Flettrich worked his way up in horse world, beginning as a working student from a young age. His background also includes participation in the North American Young Riders Championships, qualifying four times and earning individual gold and team silver. He has been competing in the FEI Open ranks since 1992. Expectations for the WEG are high. “As an American rider, competing in America, in front of American crowds. I expect it to be loud—louder than any European crowd.” noted Peters. How will the U.S. riders cope with the pressure? “You can’t get too caught up in expectations,” said Peters. “You have to ride your horse, not the scoreboard.” Peters emphasized the importance of knowing your horse. “If training and preparation went well, you can count on that,” he said. To prepare for competition, Peters reveals his strategy: “I go to the arena and picture every movement, how I’m going to ride it.” It’s a routine that has been working for Peters and his teammates, and Peters notes that has a calming effect. Flettrich will go over both the positive and negative aspects of his test right before competition. He sometimes physically walks the test beforehand as well. Tacking up his own horse for competition is also something that helps him relax. Great write up! This really sums it up well. It was cool to see the team, up close. SOOO excited to see them ride at the Games! !